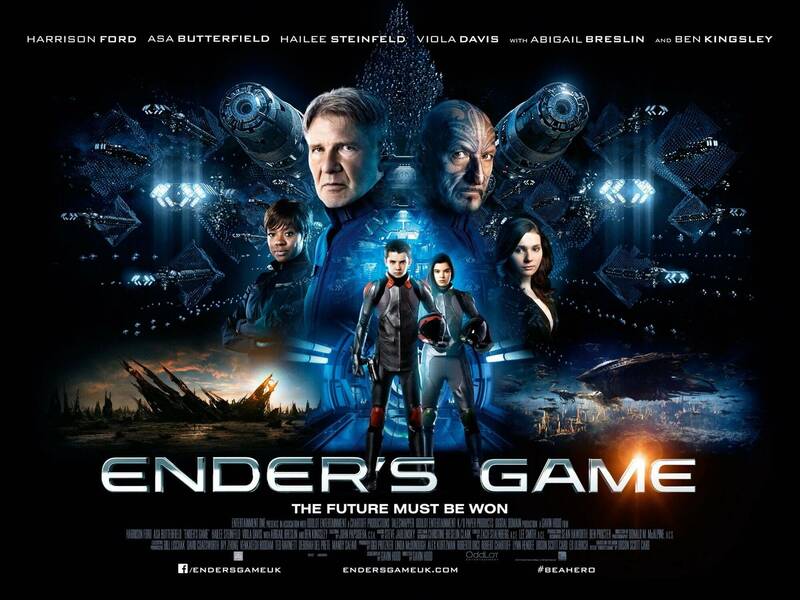 Note how Ender’s Game begins with the quote “When I understand my enemy well enough to defeat him, in that moment, I also love him.” Meant to set up the outcomes and confrontations carried out by the end only 114 minutes later, it is also supposed to ring true with its audience. Unfortunately, it leaves us without much understanding of what just happened, and as a result we admire the film, even LIKE it at most, but we don’t “love” it as that quote suggests. Once again, this is an adaptation which this reviewer has seen without reading the source material, the novel by Orson Scott Card, so is judging the movie on its own terms. First and foremost, none of Scott Card’s rampant tirade against homosexuality seems to be on display here, not even in subliminal format, so the boycotters are overreacting to say the least. What is clear, however, is how much Scott Card’s ideas and story within this fictional universe are juggled around by writer-director Gavin Hood, with some of them working to decent effect on the big screen and others not so much. Hood definitely has much more confidence and control this time round, following his previous studio disaster X-Men Origins: Wolverine, but some of the big problems from even that film seem to have seeped in to this one. For one, pivotal moments within the story seem to go by in such a flash, some passing without any cohesive development whatsoever. From what one understands about the book, the main character’s older siblings – played by Abigail Breslin and Jimmy Pinchak – have much bigger roles; that is certainly not the case in this adaptation. Breslin as older sister Valentine has almost nothing to do except give moral support to her younger brother Ender (Asa Butterfield), and any scenes that hint at development between the two are over so quick – their farewell before Ender leaves to train at a space academy – it leaves you questioning why it was included in the first place. Pinchak, as Ender’s brother Peter, has the worst luck of possibly any other actor in the movie. His character is apparently described as a tormented sociopath whose torturous methods help shape Ender’s character and motivations. In the film, he is given only one scene to convey his psychotic tendencies but nothing else, making him look like a random bully more than anything. Doubtlessly, fans of the book are going to be seriously annoyed at the treatment of this fan-favourite character. Perhaps they’re saving his character for any potential sequels, but no-one knows if they will even happen so if this turns out to be his only stretch into film then people have the right to get angry. The scenes set within said space academy, where Ender has to go to learn how to fight off the returning fleet of aliens, also have a tightened pace compared to the book. It apparently takes six years in the piece of literature for the protagonist to advance to the final stage, whereas in film land it takes him all of one year. That is bound to have left out certain major instances of development for the character, but again one is going on the assumptions of the book having not read it. Still, it feels obvious that a lot of material was cut out of the final script which again results in a rushed pace. Ender is simply promoted to a higher stage at his academy, no time to question its sudden out-of-nowhere mentality. By the time he is advanced to a much higher stage, hardly any time has gone by to take it all in. Audiences will not be intrigued by its clumsy pacing, and more so in the fact that Harrison Ford is in his first sci-fi film in 30 years. Sadly, his role here only amounts to acting as a mentor figure to Ender, looking at screens and commenting on how much Ender is perfect for his future mission, having brief conversations with a criminally-underused Viola Davis, and standing around barking orders at his cadets without getting in on any of the action. Those hoping for something of a Han Solo revival will be sorely let down. Another actor being used to limited and bizarre degrees is Ben Kingsley, as a Maori commander who acts as yet another mentor to Ender albeit a less prominent one. While his New Zealand accent is passable if distracting, Kingsley’s presence once again seems entirely useless. Take him out of everything, and the story probably wouldn’t be much different. Although to see Ben Kingsley have his face covered in a Maori tattoo is a sight that needs to be seen to be believed, he doesn’t seem to add that much. Some of the younger actors, strangely enough, seem to fare much better than their older, more experienced counterparts. Breslin, in the small amount of scenes she’s in, does fine; and Hailee Steinfeld also shows up as a sympathetic ally who again delivers an on-screen presence despite lack of definable character. Asa Butterfield, as Ender himself, brings the most gravitas to any character, and his performance is as dedicated and complex as we have seen from him in past films like Hugo and The Boy in the Striped Pajamas. Constantly at war with himself, for example stating he does not believe in violence yet contradicts his own rules when confronted by respective bully characters, Ender is an interesting character brought to great life by Butterfield. For all the negative feedback in this review so far, you’d be mistaken in thinking there was nothing in this film worth recommending. Butterfield’s performance leads the film above waters it could have very easily sunk into, but some of the ideas and how a select few have been portrayed make for some effective moments. As part of the training exercises on a space station, Ender and his classmates must partake in zero-gravity activities. These sequences are very well done for the most part, calling into mind Inception (no pun intended) and even the forthcoming Gravity, and letting you forget that they are a little pointless seeing as how it doesn’t come into play during its climax. However, they still prove effective enough to stay in the minds of audiences until Gravity’s release. Its ideas and moral standpoints give Ender’s Game a respectable few points above many other films like it, but like How I Live Now it falls into a generic category that keeps the film from reaching further heights. The climax has an anti-climactic feel once certain truths are revealed, and the actual ending is as obvious a set-up for a sequel as any. Many of the lead characters, Ender aside, do not register and serve as bland and flat supporting figures that do not do their book counterparts justice. It has interesting visual effects, but doesn’t go all the way in what it could have been. Overall, it’s a mixed bag and – going back to the quote that opens the movie – is one we cannot understand before we decide to either love or hate it. 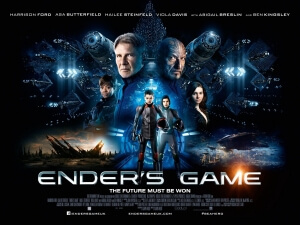 Ender’s Game is a respectable adaptation that never quite reaches levels that The Hunger Games or even Harry Potter managed to rise to, but for a slice of decent sci-fi and a committed lead performance by Asa Butterfield, it’s a decent time-waster that ranks a little better than other adaptations in the recent past.